The What: Matrox Graphics and 3M Touch Systems (subsidiary of the 3M Electronic Solutions Division) announced that both companies have validated a new 3M touch driver that will support multi-touch functionality across two, three or more 3M Multi-touch Displays powered by a variety of Matrox multi-monitor products. 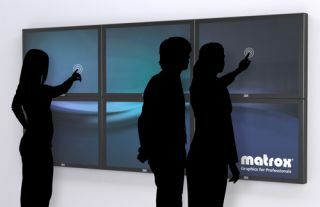 The What Else: Integrators can now pair Matrox products with 3M Multi-touch Displays to create interactive digital signage and collaborative video walls that span multiple displays, without the need for touch overlays or licensing fees. Applications include interactive kiosks, way finding, retail and exhibit display walls, as well as collaborative multi-panel classroom, boardroom, and command & control installations. The 3M MT7.14.0 driver for 32-bit and 64-bit versions of Microsoft Windows 7 is available now as a free download driver from the 3M website.